Your tolerance for investment risk is an important factor in deciding where you want to put your investment dollars, otherwise known as your portfolio allocation. After you figure out how much risk you’re willing to take, the next step is to for determine whether your current investment portfolio allocation is correct. To do this, calculate your current portfolio composition and then compare it to a mix of assets that may be more appropriate for you. 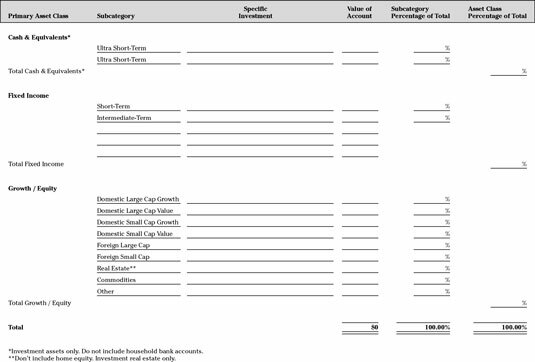 Using the My Current Portfolio Allocation Worksheet, list the investments you have. The results of this exercise provide you with your current investment portfolio allocation. From there, you can better assess whether this allocation is appropriate for your needs and objectives. Click here to download and print the My Current Portfolio Allocation Worksheet. If you have any trouble determining the subcategory for a specific investment, check that investment’s prospectus or annual report. (The prospectus is the booklet that you receive when you make the investment in the first place. If you don’t have a copy, you can request another from the company who sold you the investment. The annual reports are mailed to you automatically once a year. You can also request these booklets directly from the investment provider.) If you have Internet access, the easiest way to determine an investment’s subcategory is by visiting the Morningstar Web site, which provides some of the best free and low-cost articles, tools, and research on stocks, exchange-traded funds, and mutual funds.